snowdeal.org > ex machina: the eric update - day 268: rocking on the porch, watching passerbys. the eric update - day 268: rocking on the porch, watching passerbys. finally! after hope springing eternally it was warm enough to sit on the front porch in the rocking chair and gawk at the passerbys. no lemonade though. not quite warm enough for that yet, but soon perhaps. 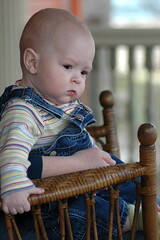 one wonders what odin was thinking while he was relaxing in the rocking chair. he's never had the chance to watch cars "whooosh" by and at the moment this picture was snapped he was watching a car pass in front of the house, so i imagine that he was trying to figure out what on earth was flying by so quickly. or maybe he was just wondering when we were going to serve up the lemonade.